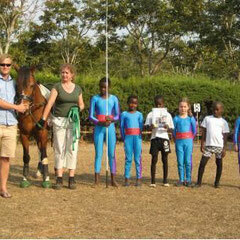 Three children participated in this event, Acacia Paul, Chanda Graf and Kate McGowan and we came 5th. 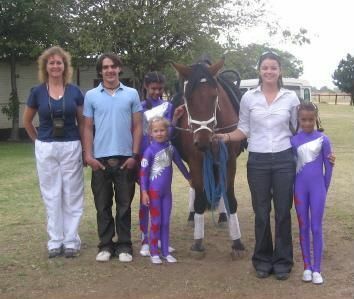 Considering that this was our first competition ever we were very proud to be part of such a fun weekend, which was extremely well organised by Barbie Gertenbach and her amazing family. We made lots of new friends from other African countries; two teams from Soweto, two teams from Johannesburg, two teams from Swaziland, and a team from Mauritius. After the Inter Africa Cup in April, Barbie found us a bigger horse. 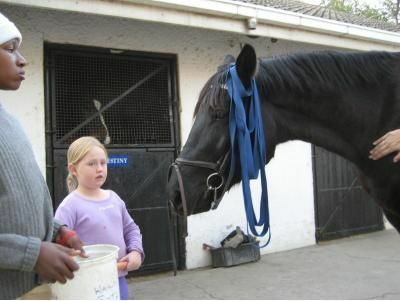 He stayed at Riba stables where, with the help of Agata Pekala and Bettina Daeppen of Switzerland together with the Riba and Soweto vaulters, he was trained to be a vaulting horse for Malawi. 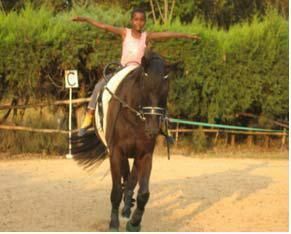 On 30th August 2007 Dekador left Johannesburg with Kevin Connolly’s assistant Aiden, who took care of him on the flight to Chileka airport in Malawi, where he was met by the Pegasus vaulters. 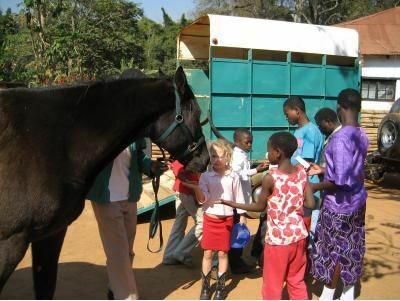 He was swiftly cleared through customs with the help of DHL engaged by Barry Brown of Skyband who sponsored the clearing, and loaded onto our horsebox to go to his new home at Thondwe. He has settled in very well and has made lots of new friends. 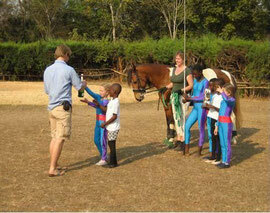 It was a great adventure for the Pegasus Team to fetch Dekador from the airport, as most of them had never even been in a car or to town before, and they got to see an aeroplane and helicopter, and of course the excitement of their new horse arriving, calmly looking around him as he took in the sights whilst lifted off the plane in his crate by a fork lift. 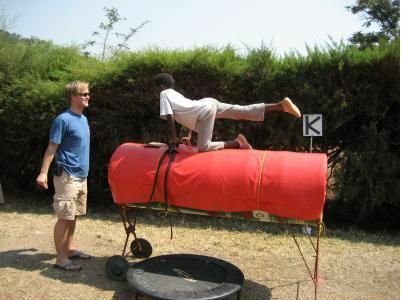 On 31st August 2007 we were visited by Holger Janssen who is State Head Coach for the vaulters in Rheinland-Pfalz in Germany. He had read an article in Aktueller Voltigierzirkel Magazin, which had been written by Bettina Daeppen! 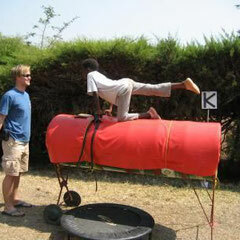 He e-mailed to ask if when he came to Malawi he might visit us and help us with our vaulting. How lucky could we be? 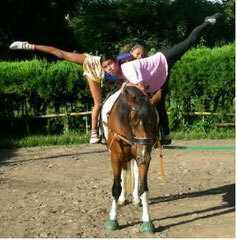 Vaulters are special people!! 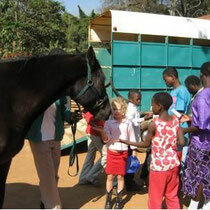 Holger is currently doing his internship at the Queen Elizabeth Hospital in Blantyre. 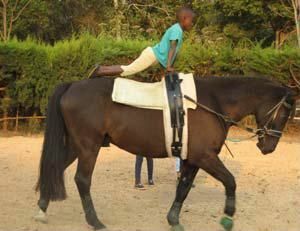 He came and stayed on the farm for the weekend and we worked together and had lots of fun lessons with him - he learnt some new Chichewa words and the children some new English and German words. 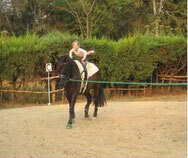 At the end of the weekend some of Holger’s fellow students came out to the farm and we put on a show, which we dedicated to him. The students and the children’s parents and grandparents all enjoyed the show. 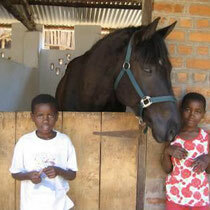 Holger has helped us in Malawi tremendously and has given us a lot to work on. We would like to extend out thanks to him for his friendship and the bond that we have built through vaulting. 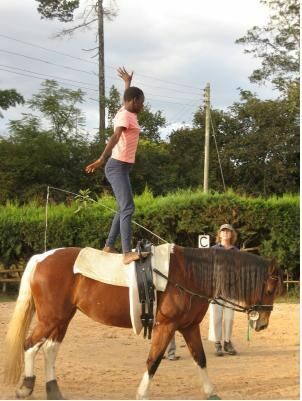 We would also like to thank him and Voltigierdvd.de for the many vaulting videos that they have donated to help us improve the sport here in Malawi. 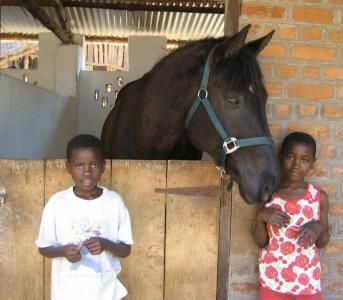 Ewen and Karen McGowan purchased Dekador in South Africa, paid for his training at Riba Stables and brought him into Malawi at their expense to help develop the sport here in Malawi. It has been a big investment on their behalf towards vaulting. Most of the children that we teach cannot afford to pay for their lessons or the clothes and shoes needed to vault in. 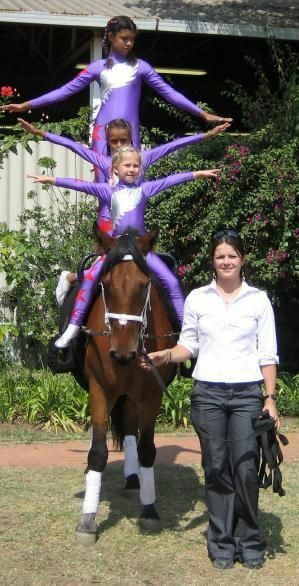 All of this has been paid for by the McGowans, who run Pegasus Vaulting Club on the basis that this fun Equestrian sport is being accessed by many children who would not normally be able to afford it. The club is currently made up of 6 underprivileged children from the farm and surrounding areas, 4 children from Blantyre who drive an hour to get here and 3 children from the Zomba area. Kate (my 7 year old daughter) has helped hugely with the development of the club in demonstrating to the kids when there were no words to describe the moves in Chichewa (the local language of Malawi). The aim is to put together a team or two who can proudly represent Malawi in the next Inter Africa Cup in 2008. 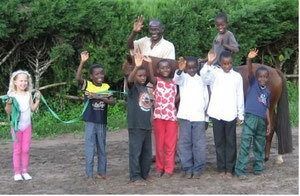 (The last entry into the IAC 2007 was totally funded by the parents of the children involved.) This time it would involve the sort of expenditure, which, as individuals, the McGowan’s as much as they would like to just cannot afford. 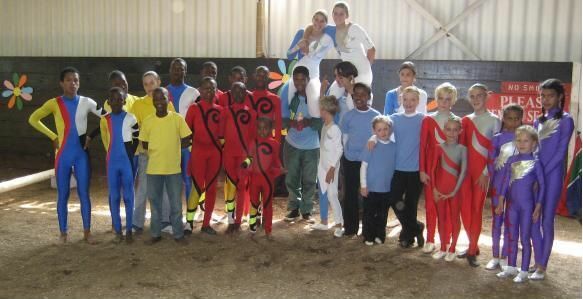 There will be the cost of passports/travel documents for the children who do not have them, air tickets to and accommodation in the host country (most likely South Africa), vaulting outfits and shoes, transportation within the host country and of course training costs to prepare them for the competition. 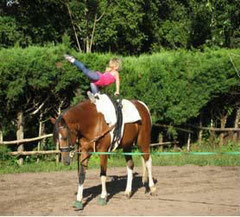 Even possibly flying our own horse in as vaulting horses are rare! 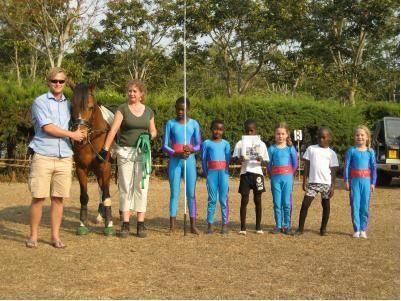 If you would like to sponsor our club or a child within the club, or help in any way at all to promote this wonderful sport in Malawi, please contact KAREN McGOWAN at mcgoos@africa-online.net or by phone on +265 999 918726.